Can a tablet replace your business laptop? Probably, if you're willing to load it up with the right apps. If you’re considering carrying an iPad or Android device around instead of your laptop, you're most likely concerned about sacrificing the functionality of a full PC--especially the office software that allows you to view and edit documents. Choosing the right tablet for your business needs can be tough; fortunately, no matter what tablet you buy, you can find excellent apps for both iPad and Android that duplicate the functionality of popular document-editing software packages such as Microsoft Office. This guide will help you select an editing app and get started in editing documents on your tablet. Quickoffice allows you to choose from many cloud hosting services. Although iPad or Android tablet users can try any of the apps created for phones (check out our guide to editing documents on your smartphone for recommendations), one application is designed with tablets in mind: Quickoffice Pro HD ($20, for Android and iPad). Quickoffice provides a plethora of tools for working with documents, spreadsheets, and presentations, as well as the extraordinarily convenient option to sync documents with cloud hosting services such as Dropbox automatically. 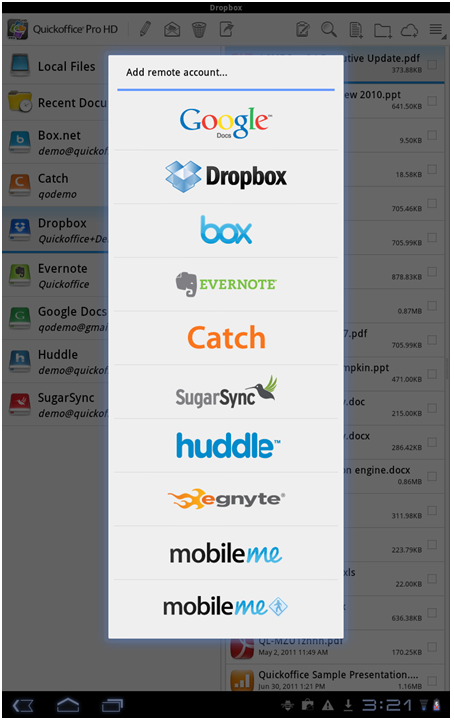 Getting started with these syncing services in Quickoffice is as simple as tapping the '+' icon in the bottom-left corner of the iPad or the '+cloud' icon in the top-right corner of the Android interface, and entering the credentials for the service of your choice. You’ll need to log in only once. After setting up Dropbox or another service, you can browse it from the left-hand menu to find a document to edit, or just create a new document using the '+document' icon in the toolbar. Though the app gives you a choice between Office 97-2003 and Office 2007-10 formats, you should stick to the newer versions (namely, the 2007-10 .docx, .xlsx, and .pptx formats) unless you have some reason not to. 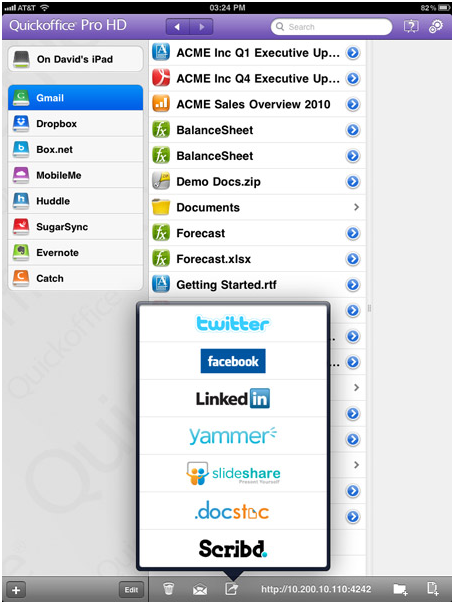 In Quickoffice you can automatically share and upload documents to a number of social hosts. Once you’ve finished editing documents and you're ready to share them, this same interface allows you to send them via email (using the dedicated email button on the toolbar) or upload them to any of several popular social hosts (using the button directly adjacent). This is a great way to work on documents with colleagues who use different platforms (PC/Mac/Linux): You can share documents on a service such as Evernote, collect the edits, and then republish the edited documents in a Microsoft Office-friendly format. Edits are easy to make, too, because Quickoffice’s text editor is straightforward and uncluttered, with Bold/Italic/Underline, Undo/Redo, Search, Print (using something like Cloud Print for Android), and Formatting options available along the toolbar. 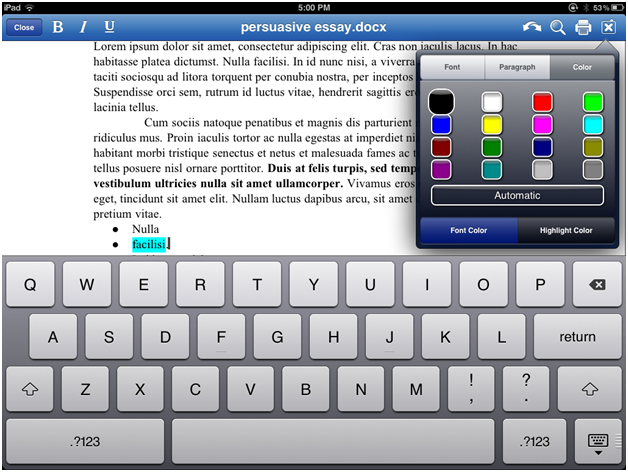 You can input, cut, and paste text by tapping or dragging anywhere inside the main interface. If that's too troublesome for you, and you own an Android tablet, consider investing in a good Bluetooth keyboard. Usually you can find a good one for under $50, but be sure to see our guide to Android Bluetooth tablet keyboards for more information and buying advice. Here's a look at Quickoffice's document editor, with the formatting menu open in the top-right corner. The spreadsheet editor is much the same, with an extra option added to the toolbar to insert new rows. You can resize or copy cells by tapping or dragging anywhere within the main interface, just as in the document editor. Clicking within the function bar brings up an elegant function-search wizard that allows you to input Excel-style functions manually, or to choose any of several common functions from a menu. This is Quickoffice's spreadsheet editor, with the formatting menu open. The presentation editor also has few surprises; the usual text formatting and undo options are right where they always are. In addition, the butterfly menu in the top-right corner allows you to insert text, shapes, or photos into a presentation, and the play icon lets you see your presentation in action. As always, you can drag images around a slide, and you can long-press to cut and paste. A free alternative to Quickoffice on Android is the official Google Docs app. Even though it’s simple enough to use--virtually all of the menu items get you to a list of your online documents, and from there it’s just one more click to Google’s famously bare-bones editor--it doesn’t permit you to work on any documents that you haven’t already uploaded to Google. Neither, unfortunately, does it let you export or email any documents in Word or Excel format, the way that the full desktop interface does; you may only invite other Google users to edit them (via the Invite pop-up menu). For this reason, the Google Docs app is a bit of a niche choice, though if your colleagues are amenable to the Docs interface, it helps that this app is free. 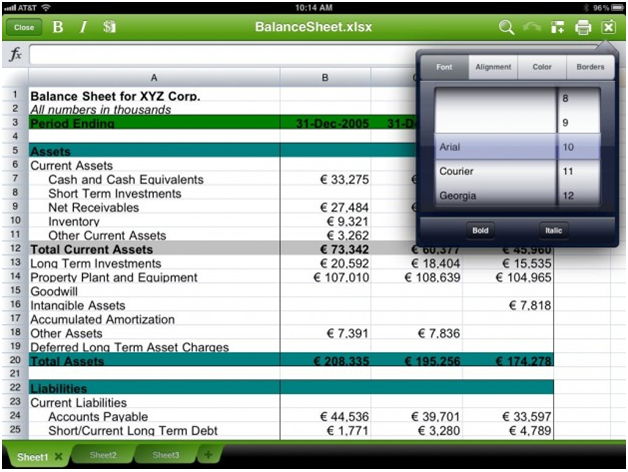 iPad users might wish to use Apple’s own iWork suite of office software, consisting of Pages, Numbers, and Keynote. At $10 each, these apps aren’t cheap (particularly since they lack the Dropbox support of Documents To Go or Quickoffice), but on the roomy screen of the iPad, they’re a great option for working with image-heavy documents, or in other cases where layout is especially important. No matter what app you choose to use, it's easier than ever to leave your heavy laptop at home and get work done on your tablet anywhere you can access the Internet. Enjoy!